History has provided us with an interesting anomaly regarding this grave. Firstly there is the straightforward legend. Jeppe was an outlaw, a 'knave' who many hundreds of years ago struck terror into the hearts of local folk. He marauded around Pendleton, Sabden and Wiswell and, along with his gang, plundered and robbed wherever they saw fit, taking whatever they wished from the more honest, law abiding fraternity. Inevitably,one of their forays went wrong, and, on the foothills of Pendle, he was caught by some of his intended victims. Instant justice was meted out and Jeppe was executed on the spot. Realising that no parish would be willing to bear the expense of a decent funeral, his dismembered body was dragged heavenwards towards the summit of nearby Wiswell Moor. There, at a point where three parishes meet, he was hurriedly interred, some local stones being collected up to mark the actual spot. Normally this would have concluded the story had not the villagers, in their excitement, mistaken a prehistoric burial mound for the summit cairn. Jeppe, instead of being interred at the parish boundaries, was in fact placed to rest within an ancient long barrow, the stones presumably having been taken from the attached cairn. Wiswell Moor forms the south west shoulder of Pendle Hill, immediately to the Whealy side of the Nick of Pendle road. 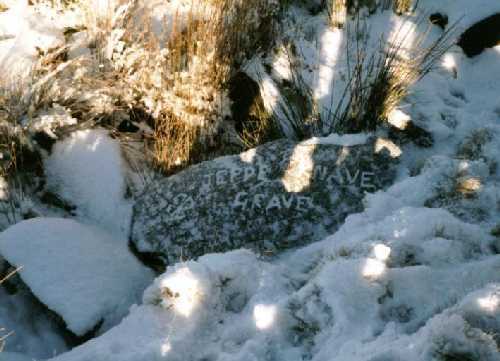 The grave can be found a short distance south west of the summit trig point.